Hong Kong has responded to international demands that the country destroy its stockpile of seized ivory, and announced that it will burn 28 tons of its illegal ivory, says the South China Morning Post. The decision was announced on Thursday after a four-hour closed door meeting between members of the Agriculture, Fisheries and Conservation Department's Endangered Species Advisory Committee. Committee chairman Paul Shin Kam-shing said the committee unanimously supported destroying the stockpile by incineration and expected it to be completed in two years. The U.S. Fish and Wildlife ServiceNational Wildlife Forensics Lab confirmed the difficulties of burning elephant ivory during experiments it conducted under controlled conditions at a specialized arson facility in 2008. Using oxygen-enriched propane to generate ultra-high temperatures (roughly 1,800 degrees Fahrenheit), an ivory tusk lost about a quarter ounce of its weight per minute. 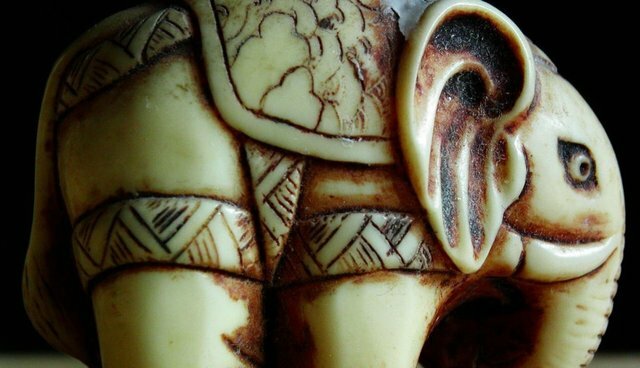 At that rate, depending on the temperature and duration of the fire, and the size of the ivory pieces, it could take months to burn one ton of ivory. "To really destroy ivory," said Ken Goddard, Director of the National Wildlife Forensics Laboratory, "it needs to be crushed." For now, conservationists are pleased with Hong Kong's step forward. "It's great to finally see the government joining others around the world in taking the lead on this," Alex Hofford, program director for Hong Kong for Elephants, told the South China Morning Post. This is great progress, however, the government also announced that it will keep 1.6 tonnes for educational purposes in schools -- a move that conservationists oppose. "We don't [think] there is any place for ivory in the classroom," said Hofford. "it's like handing out bags of drugs to students to educate them about the drug trade."